In a meeting with Joe Z this week at the IAB Annual Leadership Meeting (ALM) in Phoenix, Arizona, one of our partners dated our relationship by saying, “Seven IABs ago…” It was said with humor, but the fact also communicates the importance of this particular gathering of the IAB and its members to our community. We date our progress and relationships to some degree by the passing of the conferences—and in an industry that moves at lightning speed, that’s saying something. It was like being Lady Gaga at the Grammys (which happened to be trending on Twitter at the same time we were live-tweeting the #IABALM opening). But beyond the accolades, for which we were very humbled, we learned and grew ourselves. Conference speakers communicated the important message that we are in a new age of disruption on three fronts. First, direct-to-consumer (DTC) brands have come of age and are disrupting the markets in which they compete as well as the way in which businesses use data. Second, marketers are demanding to get and know more from the advertising and marketing technology that connects them to consumers. Third, privacy is no longer an issue for the legal department, it is an existential challenge that demands the ecosystem’s full attention. The main stage at the conference opened with IAB CEO Randall Rothenberg delivering a flawless and well-constructed presentation of the disruptors among us (check out the IAB 250 Report to discover the most important disruptor consumer brands in U.S. economy). He highlighted that DTC brands are growing in ways that outpace incumbents in their market and doing it using data and digital platforms as well as traditional physical infrastructure and linear television. For the programmatic world, these companies are relatively new to the scene, largely dependent on Facebook because it is easy and it is what they know, but they are seeking alternatives and seeing the benefits of trying out different digital paths to consumers. Over time, we believe they will become key demand-side actors in the space, and we aim to serve them. After Randall’s speech, he welcomed to the stage the founders of the wildly successful DTC brand ThirdLove. Their presentation was interesting because of how data-enriched their service is and the story they tell about how ThirdLove came to be. First the data. It tells you things that are at first counter-intuitive. The brand’s primary customer is not in cities, and it’s not all millennials. The feedback from consumers drives the brand’s product development and sheds light on things ranging from the need for different color undergarments to reflect different skin tones to the importance of women over age 30 seeing themselves reflected in marketing. For those of us from MediaMath in the audience, we saw a kindred spirit in the young DTC company. It is up against much larger competitors, taking risks, working as a force for good using its product to help women and girls around the world, and investing and reinvesting in its technology as a tool for driving value for customers and employees. While Mike was in one ballroom, Danny Sepulveda was in another communicating our passionate commitment to doing right by consumers and the ecosystem when it comes to privacy. Joined by luminaries in the business John Montgomery from Group M, Townsend Feehan from IAB Europe and Doug Miller from Verizon, the group agreed that the business needs to plan for the new California privacy law as if it will go into effect without changes while respectfully advocating for reasonable amendments to the law for the good of the ecosystem as a whole. The panel was ably moderated by the IAB’s man in Washington and an old friend of MediaMath’s David Grimaldi. The other message that the panel delivered was that the ecosystem needs to invest in, rally around and present a better way to design law that does right by consumers without distorting the data-driven economy in favor of one business model or at the cost of creating barriers to independent ad tech’s existence. No single part of the ecosystem is independent from the others. We work to serve each other—publishers, marketers, agencies and tech providers alike—and when we do it well, information is not hoarded or trapped inside a garden—it is distributed and shared with respect for consumer privacy to serve their market needs. We at MediaMath are committed to that value exchange and are working hard to deliver it within the construct of a mature, responsive and respectful tech stack. We also know that education plays a critical role in moving the industry forward. It’s fitting that NMI just celebrated its seventh birthday (seems to be our lucky number). Having had an opportunity to connect with industry colleagues and friends during the conference, there seemed to be shared enthusiasm for our commitment to education and the acknowledgment that this industry is complex and fast-moving. Creating a safe space in which to have bold conversations, recognizing where the learning gaps exist and designing a structured educational framework that drives adoption of new technologies and digital transformation are critical components. Seven IABs from today, we will still be there, having constructed a digital path to consumers that is simple, scaled and accessible to brands, from those with pop-up stores and a quality product of any size to publishers with engaging platforms on which to reach consumers. Lauren is the Senior Director of Content at MediaMath, responsible for creating, executing against and managing the global, data-driven content strategy that informs key themes and messaging across paid, owned and earned. A native of the Jersey Shore, Lauren graduated from La Salle University in Philadelphia with an English degree that she has put to use as a print journalist, trade magazine editor, professional blogger and now content marketer. After a 3.5-year stint in Sydney, Australia and a 4.5-year stint in New York City, Lauren now lives in Phoenix with her husband and two children. She loves to travel, read true crime books and eat all the dark chocolate. The fact that CES takes place at the very beginning of the year makes it a great event for taking a temperature check of the sector and using those insights to set our intentions for the year ahead. Partners, clients, prospects, brands and thought leaders all highlighted the two big trends in our world that we believe are undeniable and unavoidable. One, giant walled gardens are devouring digital budgets and gatekeeping access to audiences to the frustration of everyone else in the ecosystem. Two, the open web faces renewed scrutiny of longstanding structural inadequacies that hinder its growth and also frustrate marketers, publishers, partners and consumers. These two realities leave marketers, partners and independent publishers on the open internet and consumers with two poor options. The Consumer Electronics Show is a marketing event, and going was more than worth it. CES organizers realized that the advertising and marketing technology community were gathering organically at CES every year and created a dedicated space for us. They called it C Space. And it works. There are also panel discussions on hot topics. According to CTA, 87 percent of Fortune 100 companies had a presence at C Space. Instead of bouncing from coast to coast to meet with key partners and stakeholders, we could do it in one place while simultaneously getting a sense of the larger zeitgeist. Transparency, relationships and serving those relationships matter as much or more than the technology: Repeatedly, we heard in meetings and in the halls a strong desire for adtech companies to continue to mature to begin systemically serving the needs of marketers and their partners and publishers more quickly and with a true service mindset. We see this as creating “transparency to build trust” in the ecosystem. The sector can no longer expect marketers to spend money on advertising delivery mechanisms and tools that they do not understand and that provide no useful data back to them on meaningful business metrics and where spend goes. Additionally, partners and brands must be able to customize for their competitive needs as well as bring their own investments into play with ad tech solutions across identity, cognitive intelligence and supply. But they also demand personal attention and speedy solutions in response to inquiries. Adtech in general can also no longer expect that publishers will just sit back and allow ad spend to be siphoned off without good cause as it travels through the ecosystem to them. Every actor and partner in this ecosystem matters. We communicated that at CES, and we intend to continue to live it as a company. Identity is the key to serving consumers, and what matters is serving consumers, not just channels: CES was replete with discussions and deliberations about how to construct identity-based solutions for marketing, even as the pursuit of relatively new channels, from connected TV to cars, was excitedly discussed. We communicated our strategy to enable brands to respect and be relevant to the consumer by supporting the development of a single view of people, not devices, and an observed behavioral understanding. For that understanding of the consumer to be useful, it must be both accurate and portable as well as respect the rights of the user. People were excited to hear that the core of our identity graph is deterministic, while allowing for you to choose to expand further by activating probabilistic as well as brand and partner data. Accuracy in behavioral understanding is also important, which is why our MediaMath Audiences are based on observed actions, allowing us to ensure advertising experiences are mapped to these consumer actions vs. delivering poor, generic, disruptive experiences with too broad, third-party audiences that are not efficient uses of a marketer’s investment. And we are equipped to deliver in the multi-channel environment. Privacy was everywhere. From Apple’s clever, if not misleading, billboard that read “What happens on your iPhone, stays on your iPhone,” everybody, especially in the government and thought leader discussions, was talking about privacy. Respecting the boundaries of what collection and distribution of information is necessary for effective marketing—without being intrusive or disregarding the wishes of consumers relative to how they want to be seen and approached—is becoming table stakes for adtech businesses. And government is moving to make it illegal to do business any other way. Teams win. One of the joys of traveling with such a large team of MediaMath colleagues is getting to know each other, our partners and client brands and working together in an intense setting in various environments. In fact, of particular use for building a teams win strategy and one of the oldest ways of affirming relationships is to break bread together. We did that. And for the record, it was delicious. Our founder and CEO Joe Z’s parting words for 2018 will ring true in the new year as marketers the world over shift more spend to programmatic, streamline budgets across channels instead of treating them as silos and more heavily invest in channels like addressable TV. 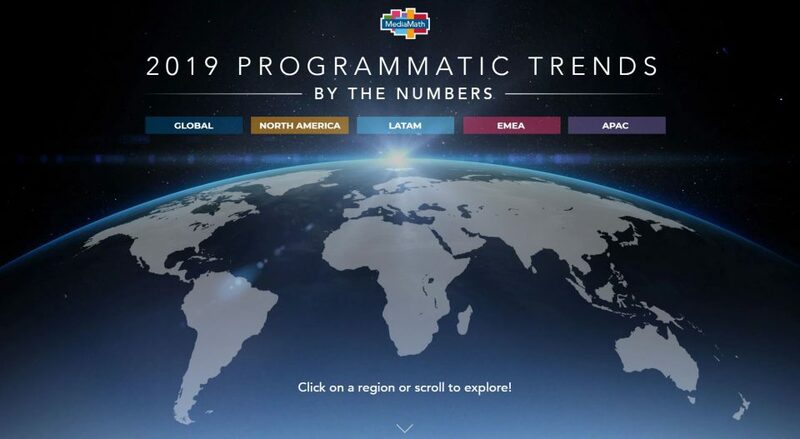 Read below to see our list of 19 programmatic trends for 2019 from around the world.